I've really enjoyed the last three days - getting to actually make some LOs myself! Here's the one I did today - click to enlarge. Hope you enjoy! Credits: Flag by www.heatheranndesigns.com; Cord Border by http://digital-scrapbooking-japan.blogspot.com/; some elements from www.cinnamon-designs.com; Ribboon by BlueFairyDesigns@gmail.com. We ladies love our potpourri. It adds a beautiful elegance and lovely fragrance to our homes, but it only lasts till it gets dusty and it's pretty expense to keep replacing. This is a picture of my potpourri in my bathroom. When I receive flowers, or cut them from my garden, when they first start to pass "beautiful and fresh" in the vase, I dry them for potpourri. Loosely bind the flowers with string and hang them upside down in a dark cool place that has air ventilation and then forget them! When you are sure they are completely dry, then you can collect them into a zip lock bag. Larger blossoms you'll want to separate the petals and the small blossoms are pretty just breaking the head off and using them whole. You can keep them in the bag, left open a little, indefinitely. If you close the bag and there is still moisture in the flowers, it will mold. The second part of this is to find an oil that you love and buy a bottle of it. 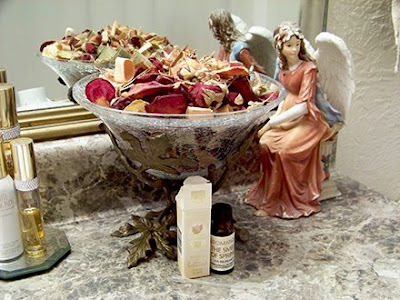 You add 2-3 drops of oil to your potpourri each time the fragrance starts fading. (The dropper came with my bottle). It lasts a long time and each bottle holds enough oil to do this countless times. I've used the same one for about 12 years now. My favorite is "The Smell of Spring" by Aromatique, Inc. from www.arromatique.com. I bought mine at the end of spring clearance sale at McRae's department store for $5, but it lists for $8. Obviously potpourri is not a NEED, but doing it this way it's a guiltfree elegance anyone can afford. The total cost was $8 plus tax and time spent was about 5 minutes! And how is this inspirational? We are to be good stewards of all God gives us! This is not only saving money, but recycling! Praise the Lord in ALL THINGS! If you'd like more of these, let me know and have a super day! 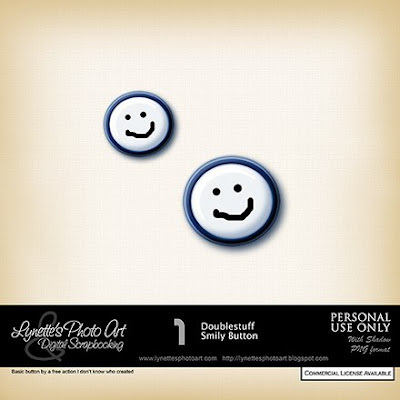 Today I have this adorable Double Stuff Smily button for you that I made years ago with a free action by an unknown creator - enjoy! Thank you so much for this Freebie. I want to let you know that I posted a link to your blog in Creative Busy Hands Scrapbook Freebies Search List, under the Elements or Papers post on Aug. 16, 2009. Thanks again.